Your shoulders are a miracle of engineering. They’re one of the most complex joints in your body, containing four entirely separate joints, each with their own muscle groups and bones. Together, these bones form the only joint in your body that’s designed to rotate a full 360 degrees. When most clients come to our Caulfield physio with shoulder pain, it’s usually due to a lack of understanding as to how to use such a freely mobile joint safely and correctly. These are fairly easy to treat: take the weight off your shoulders (literally). One very common injury that people dread, but shouldn’t, is bursitis. 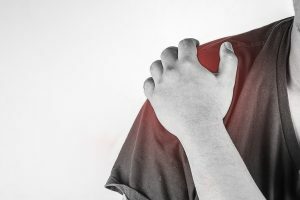 So, what is shoulder bursitis? And how can our physio in Caulfield help treat and manage it? Before we explain shoulder bursitis treatment, we need to explain what your bursae are. Present in every joint in your body, bursa are fluid-filled sacs that act as cushions in your joints. Your bursae reduce friction in your joints by providing a soft buffer between your bones and the muscles around them. Additionally, your bursae contain synovial cells, which produce a lubricant that further reduces the amount of friction in a joint. Combined, this cushioning and lubrication ensures that movement is completely effortless. Finally, your bursae stops your bones and muscles from knocking into each other – without that, movement would be a literal pain. Like the name suggests, bursitis is a painful condition that affects the bursae in your joints. Bursitis causes your bursae to become inflamed and sore, resulting in difficult or painful movement. Additionally, continuing to use the affected joint can aggravate your bursa even further. In most cases, this is caused by overuse of a joint with sub-optimal movement mechanics. Repetitive actions such as typing, painting and some sports can strain your bursae, wearing them out. Another common culprit is injury. Trauma from a fall can damage your bursae, leading to the tell-tale pain and swelling in your joints. Oftentimes, the first sign of impending bursitis is pain and tenderness around your shoulder joint! Dull, aching pain sometimes spreading down the arm can be a sign of bursitis. If you find it uncomfortable to sleep on one side then this is often a tell-tale sign of bursitis! Swelling is another sign to look out for that will distinguish bursitis from your run-of-the-mill shoulder pain. Damage or strain on your bursae causes inflammation in the affected joint. While your shoulder contains multiple bursae, many of them are close to the surface, meaning that it’s pretty easy to tell when you have shoulder bursitis. So if your shoulder pain comes with a noticeable bulge or unusual redness around the joint, it might well be a bursa issue! For a proper diagnosis, it’s best to talk to a qualified physiotherapist. How long does shoulder bursitis last? Well, that depends on how you treat it – and that’s where your Caulfield physio comes in. All of our treatments are backed by an in-depth understanding of the human body and how the various muscles, tendons, ligaments, and bones work. Using a combination of massage, dry needling and shoulder and spine exercises, your physio can help reduce pain and promote recovery of the affected bursae. In the case of bursitis caused by overuse, your physio can help you alter your routine to minimise the strain on your affected joint. Additionally, we might also prescribe joint protection tools such as braces and splints to protect your bursae from further aggravation. In severe cases, you may have to go to a doctor to have your bursitis medically treated. In extreme cases, hydrodilitation and cortisone may be needed to reduce the swelling in that bursa. However, you should not seek these injections before being assessed by your physiotherapist. Overuse of cortisone can lead to brittle bones and a host of other health complications, so don’t be too quick to go down that road. Your physiotherapist’s job doesn’t end with treatment. We’re all about the big picture – once treatment is over, our focus shifts to sustaining your strength and keeping your shoulder joint limber. In addition to changing your routine during the recovery phase, your physio will also work with you to analyse how you use your shoulders. If repetitive tasks are part of your job for instance, a permanent change to your routine or technique might be needed to prevent the return of bursitis. Strength exercises are another way your physio helps keep your shoulder healthy. Strengthening exercises condition an affected joint for repetitive tasks and can increase its range of motion, reducing your chances of remission. Get out of pain and sustain your results with Physio AUS! Whether you’re a professional athlete, fitness freak, or everyday Aussie, an experienced physio can help you restore your ideal level of mobility that allows you to live your best life. Got a question? Give us a call on 1300 392 552 or fill in this form and we will be in touch!